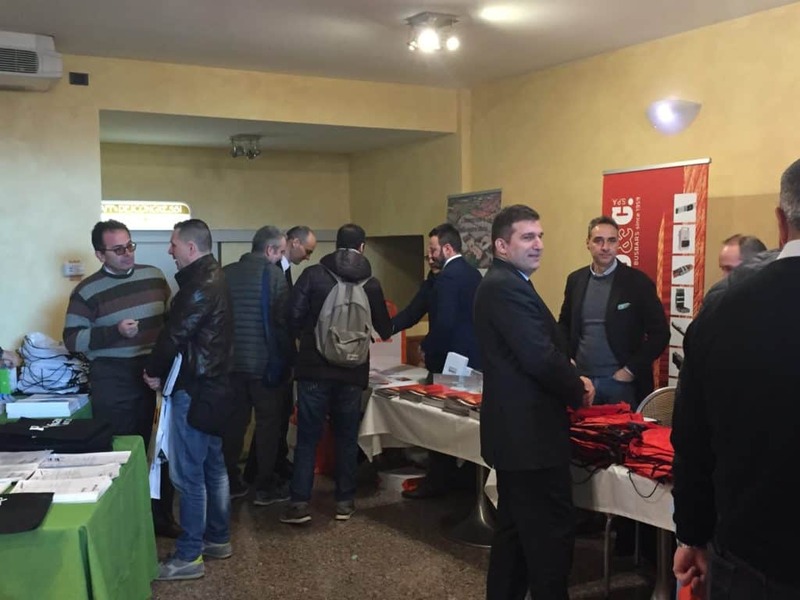 Graziadio & C. also sponsors the 2019 Free Training Conventions in 2019. The same are dedicated to the safety and operation of user electrical systems between technological and regulatory developments. 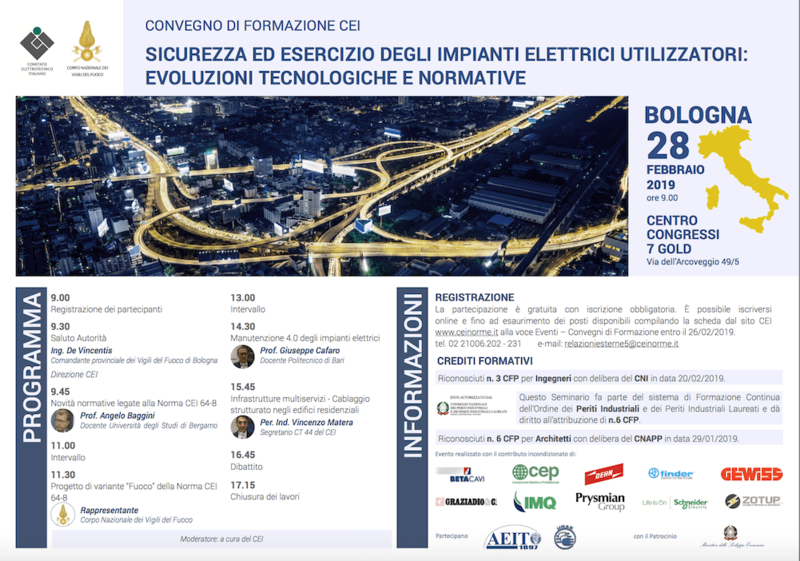 The regulatory aspects in the field of electrical plant engineering and the tendency of industrial automation to integrate some new technologies to improve working conditions and increase productivity are closely connected. With this in mind, Industry 4.0 assumes crucial importance. Regulatory news related to the CEI 64-8 standard: purpose of this presentation is to illustrate the new Sections 443 and 534 of the CEI 64-8 Standard dedicated to the general characteristics of the protection against overvoltages (in particular those due to lightning) as well as the choice related protection devices (SPD). The report is completed with information on the new Section 722 on charging systems for electric vehicles, as well as on the recommendations regarding the execution of the ground systems indicated by the new Guide CEI 64-12. Design of the “Fire” variant of the CEI 64-8 Standard: electrical systems must be designed and installed in such a way as to avoid or reduce to a minimum the risk of igniting and spreading a fire; the provisions of the CEI 64-8 standard indicate how to satisfy this need. To these are added the mandatory requirements required by the fire prevention decrees issued by the National Fire Brigade. In order to harmonize the contents of the norm and decrees the new “Fire” Variant has been developed, the main aspects of which are the subject of this report. Maintenance of electrical systems 4.0: maintenance is a fundamental requirement for maintaining the functionality and safety of all plant engineering areas. On the other hand, these two aspects are inseparable in electrical systems. Maintenance in user electrical systems is therefore primarily a legislative obligation. On the one hand, the new technologies create the need to guarantee the functionality of the systems in order to maintain the functional standards of the project and on the other allow to conceive the maintenance in new and less invasive forms. The continuity of the service is a renewed functional requirement of the electrical systems users, also guaranteed by innovative maintenance techniques also supported by an innovative technology. So we can talk about a maintenance 4.0 that is accompanied by the innovation of the applicable CEI standards and guides. Multi-service infrastructures – Structured cabling in residential buildings: Obligations, current legislative provisions and future guidelines, also with a view to energy efficiency, require the integration of a passive multi-service physical infrastructure inside the residential buildings, consisting of adequate installation spaces and high-speed fiber optic communication systems up to the network terminal points, to allow the installation of electronic communication systems (television, data transmission, telephony, etc.). The new CEI 306-2 Guide completes the framework for the design, installation and verification of these new systems for both new buildings and existing buildings in which a technical-economic compromise must be found. With regard to the new CEI 306-2 Guide, this report intends to present to all the players in the supply chain the main opportunities, innovations, technical evaluations and future developments of these innovative infrastructures to be realized or only to be prepared so that the building can benefit , for the purpose of the sale, of the rent or sale of the property, of the voluntary and non-binding label of a building arranged for broadband. Recognized n. 3 CFP for Engineers with CNI resolution on 20/02/2019. This Seminar is part of the Continuing Education System of the Order of Industrial Experts and Graduated Industrial Experts and entitles to the award of 6 CFPs.